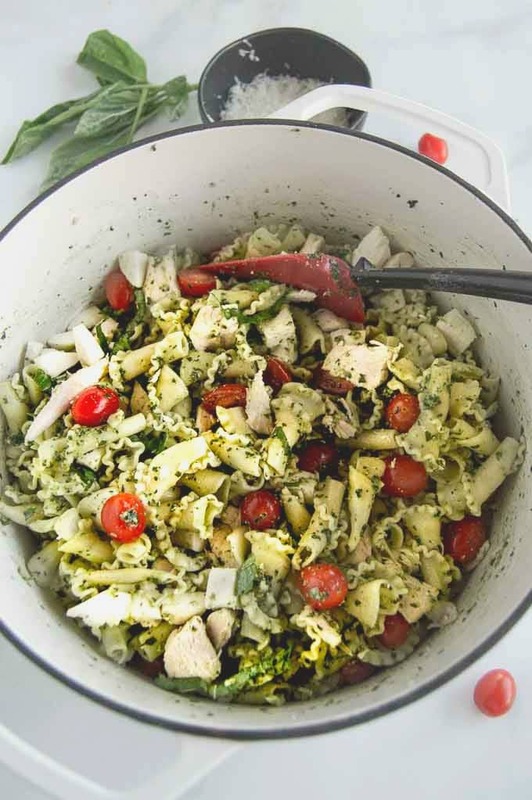 Chicken Pesto Pasta Salad is made with fresh ingredients bursting with the flavor of pesto for a full meal or a hearty side dish for any BBQ! Chicken Pesto Pasta Salad is a mainstay at our house! 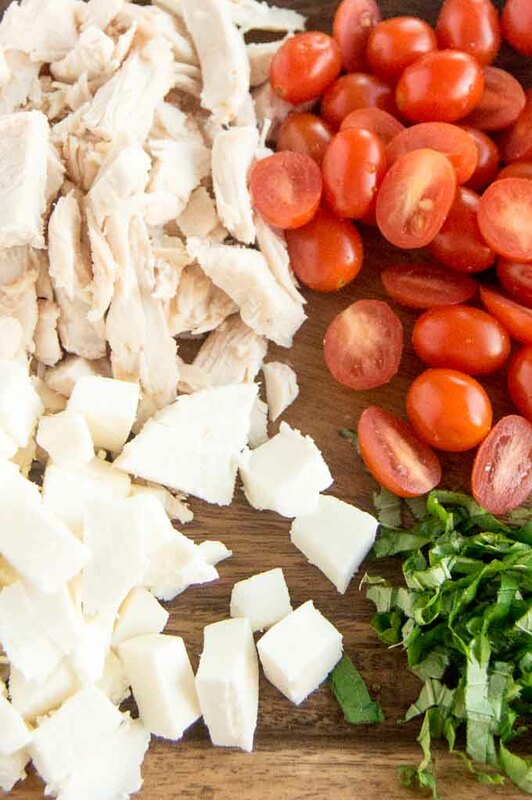 Made fresh with a homemade pesto sauce tossed with tomatoes, mozzarella and chicken that comes together in no time! 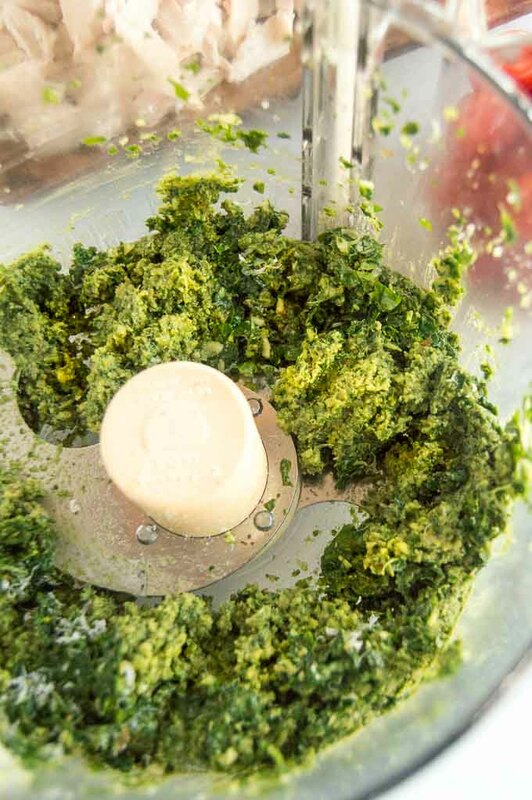 The pesto sauce packs a flavor punch with the fresh herbs, tangy parmesan cheese, and the fresh chopped garlic. Olive oil acts as a binder and also helps coat the pasta evenly. 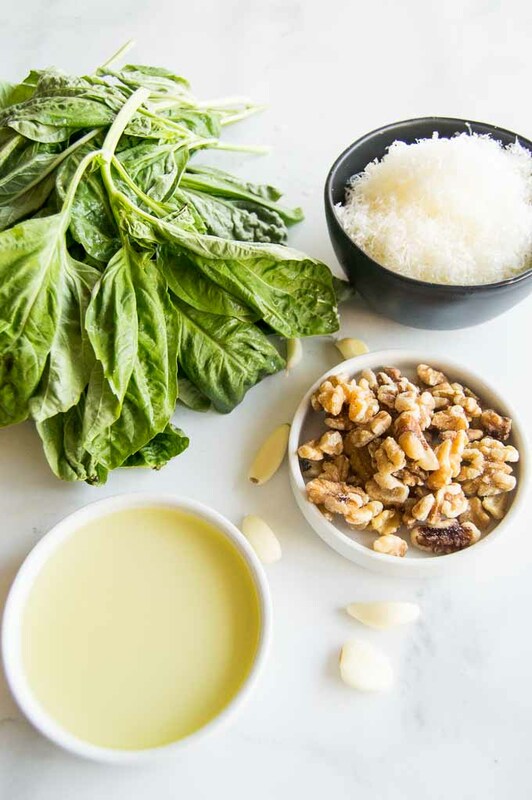 Pesto is a Genovese sauce traditionally made with basil, nuts, parmesan, olive oil, and garlic. All of these ingredients are placed in a food processor and blended to make the sauce. Often pine nuts are used, but in this recipe, I used walnuts, although you can sub here too. Pecans and almonds also work great as an option. 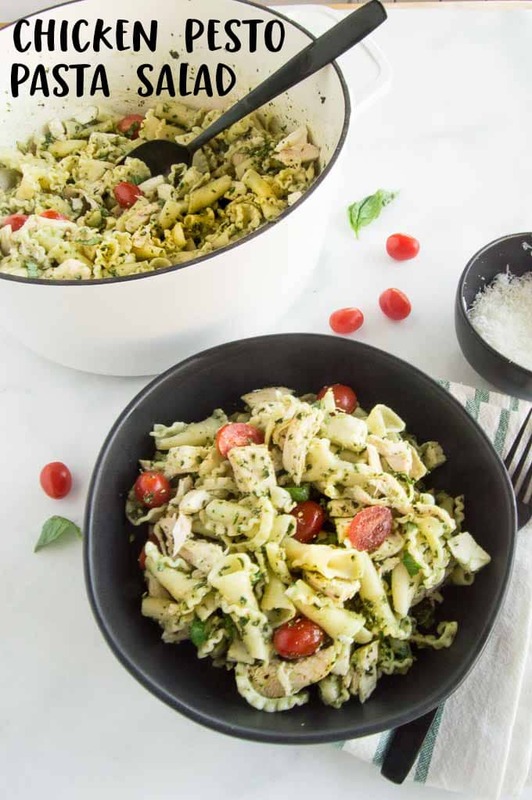 In the recipe for Chicken Pesto Pasta Salad, I’m sharing today has freshly made pesto sauce tossed with cooked pasta and made into a full meal with the addition of tomatoes, chunks of mozzarella and pieces of chicken. 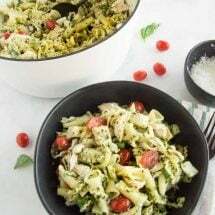 When you are making the pasta salad the easiest way to make sure that the pesto is evenly spread is to make sure and add the pesto to the pasta and mix well before adding all of the other ingredients. At this point, you can add a little extra olive oil or a save a little of the water the pasta was boiled in and add it in to help spread the pesto sauce if it looks clumpy. 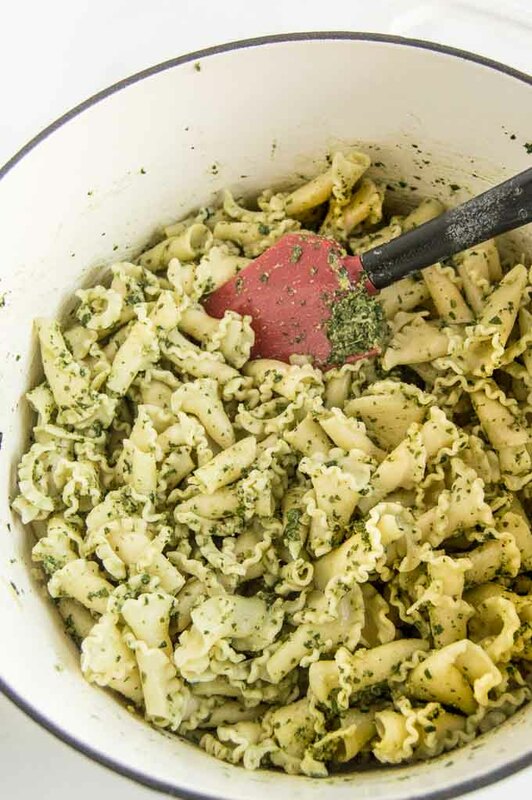 Anything you are adding to the pasta salad will need to be cut into uniform bite-sized pieces. I removed all of the bones from the chicken and shredded it, the tomatoes were cut in half, then the mozzarella cheese was also cubed for easy eating! For added flavor, I also sliced thinly some extra basil to sprinkle on the top. 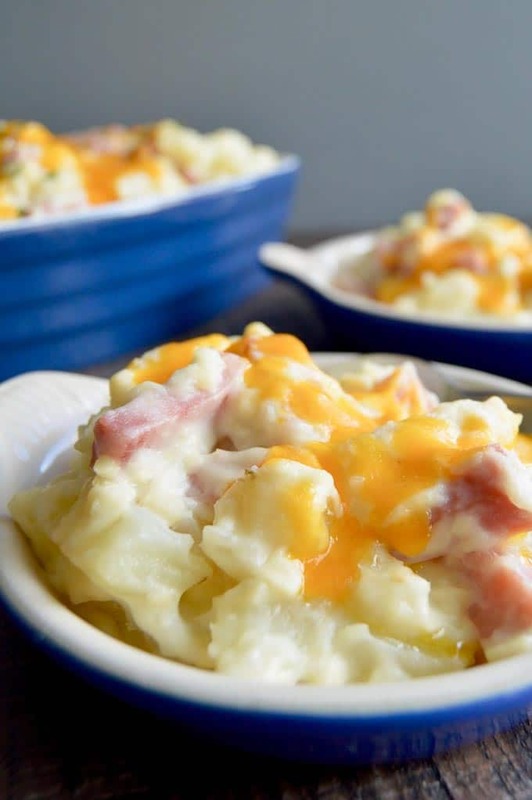 Complete you grill out a menu with the other family favorites! 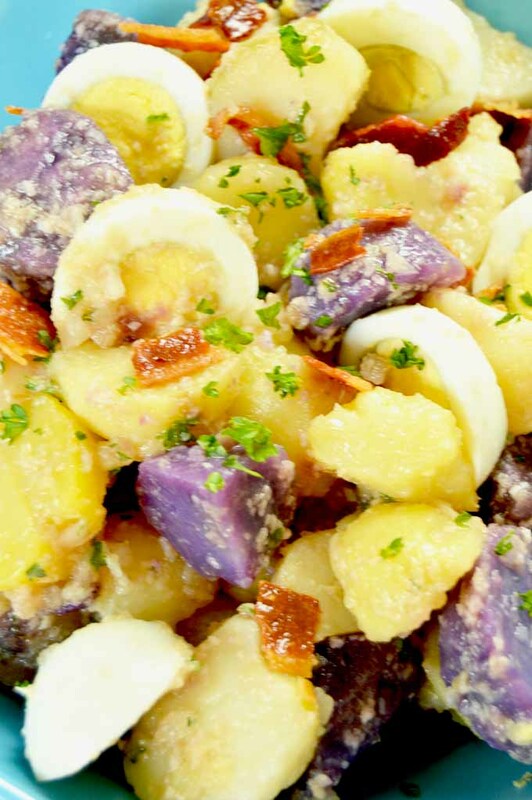 Looking for other hearty dishes to bring to a potluck or BBQ? Check out these offerings!